← Svet Sunday: All In Your Hands! Kola: The Race to the Center of the Earth! 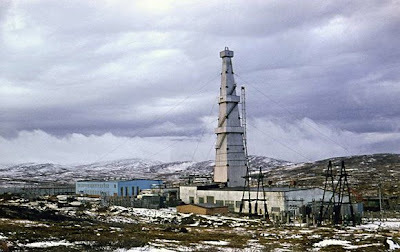 I found an interesting subject from the Soviet era: The Kola Superdeep Borehole! It reached a depth before stopping: 12,262 meters = 44,290 ft = 7.62 miles! 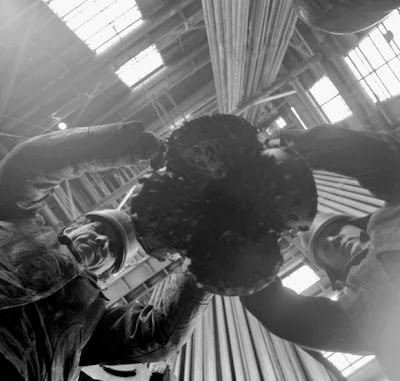 The Kola Superdeep Borehole (Russian: Кольская сверхглубокая скважина) was the result of a scientific drilling project of the former USSR. The project attempted to drill as deep as possible into the Earth’s crust. 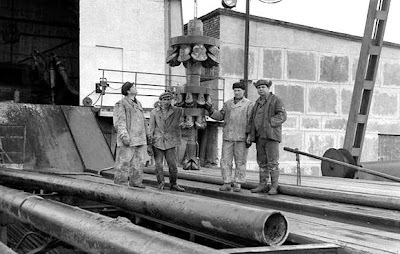 Drilling began on May 24, 1970 on the Kola Peninsula, using an “Uralmash-4E” and later an “Uralmash-15000” drilling device. A number of boreholes were drilled by branching from a central hole. The deepest, SG-3, was completed in 1989, creating a hole 12,262 meters (40,230 ft or 7.62 mi) deep, the deepest hole ever made by humans. The project was first proposed in 1962 and was assigned to the Interdepartmental Scientific Council for the Study of the Earth’s Interior and Superdeep Drilling. 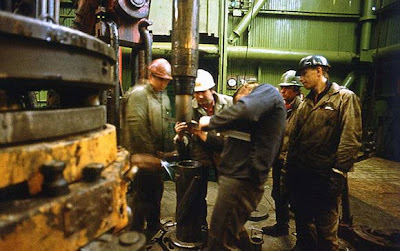 The drill site was chosen in 1965 in north-west Soviet Union, 10 kilometers (6 mi) west of the town of Zapolyarny, Russia. The initial target depth was set at 15,000 meters (49,210 ft). On June 6, 1979, the world depth record held by the Bertha Rogers hole in Washita County, Oklahoma (9,583 meters (31,440 ft) was broken. In 1983, the drill passed the 12,000 meters (39,370 ft) level and stopped drilling for about a year to celebrate the event. 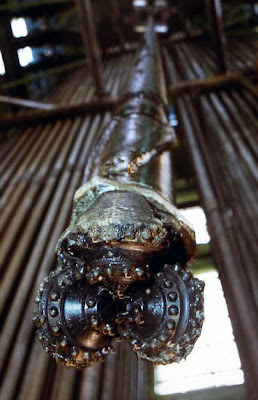 This idle period may have contributed to a disappointing break-down on September 27, 1984: after drilling 12,066 meters (39,587 ft) down, 5,000 metres (16,400 ft) of boring pipes tore off and were left in the earth. It was decided to drill again from 7,000 meters (22,970 ft). The hole reached 12,262 meters (40,230 ft) deep in 1989. In that year the hole depth was expected to reach 13,500 meters (44,290 ft) by the end of 1990 and 15,000 meters (49,210 ft) by 1993. However, due to higher than expected temperatures at this depth and location, 180 °C (356 °F) instead of expected 100 °C (212 °F), drilling deeper was deemed unfeasible and the drilling was stopped in 1992. With the expected further increase in temperature with increasing depth, drilling to 15,000 meters (49,210 ft) would have meant working at a projected 300 °C (570 °F), at which the drill bit would no longer work. The Kola borehole penetrated about a third through the Baltic continental crust, presumed to be around 35 kilometers (22 mi) thick, exposing rocks 2.7 billion years old at the bottom. The project has been a site of extensive geophysical studies. The stated areas of study were the deep structure of the Baltic Shield; seismic discontinuities and the thermal regime in the Earth’s crust; the physical and chemical composition of the deep crust and the transition from upper to lower crust; lithospheric geophysics; and to create and develop technologies for deep geophysical study. To scientists, one of the more fascinating findings to emerge from this well is that the change in seismic velocities was not found at a boundary marking Jeffreys’ hypothetical transition from granite to basalt; it was at the bottom of a layer of metamorphic rock that extended from about 5 to 10 kilometers beneath the surface. The rock there had been thoroughly fractured and was saturated with water, which was surprising. This water, unlike surface water, must have come from deep-crust minerals and had been unable to reach the surface because of a layer of impermeable rock. Another unexpected discovery was the large quantity of hydrogen gas, with the mud flowing out of the hole described as “boiling” with hydrogen. The site is currently controlled by the State Scientific Enterprise on Superdeep Drilling and Complex Investigations in the Earth’s Interior (GNPP Nedra) as the Deep Geolaboratory. That is a long ways straight down…….